A Yeshivah bochur just came back to Melbourne from where he was learning in the USA and said that while he was away he had his tefillin checked. Everything was fine, except the sofer told him that in the last parsha of his shel yad the words "vechoro af" are on two separate lines. I think his complaint is that from there the sofer did not follow the roshey hashitin of the Arizal exactly. We have discussed this before and while there is room to be machmir about Roshe Hashitin in mezuzah, I have never heard anyone make an esek of it in tefillin. I have always understood that in tefillin a small shinuy like this would present no issue. The tefillin were not purchased from me so I am not nogeya badovor. However the boys father asked me if he should change the parshiyos. He said he wants everything 100% mehudar, which is understandable. I was wondering Reb Moshe's opinion on this and /or if anyone else has had such a situation. With all due respect this Mishnas Avrohom is talking about a sefer torah. And even then he says you don't need to fix. question is, what do I do with this bochur: He's adamant that something is wrong with his tefillin thanks to the advice he got when he checked them. What do I do now? 2- Explain the concept of HaTorah Chasah al memonam shel yisrael. 1. The ראשי שיטין which I will not go into it now. 2. The וחרה אף are on two lines. Unfortunately the Tefillin are בדיעבד. The reason that וחרה אף are supposed to be on one line is not because it is more aesthetic or a similar reason. It is because there is a whole group of words such as מלכי צדק, תובל קין, בעל חנן, as well as וחרה אף and וחרה אפי and others that there is a debate if it is one word or two words and the מסקנה למעשה is two words one line. This reason applies to Teffilin as well and not just by ס"ת. Therefore if the guy "wants everything 100% mehudar"' so yes indeed he should change the פרשיות. If he paid a "premium" price for these פרשיות, he should demand a refund or exchange from where he purchased them. Sholom, you can see above that the source that brings down that all these words being together on the same line is clearly speaking about a sefer torah only. What is your reasoning or sorce as to why this would be the din by tefillin? I read the משנת אברהם above, and I couldn't find any reference to the fact that it is only in a Sefer Torah. 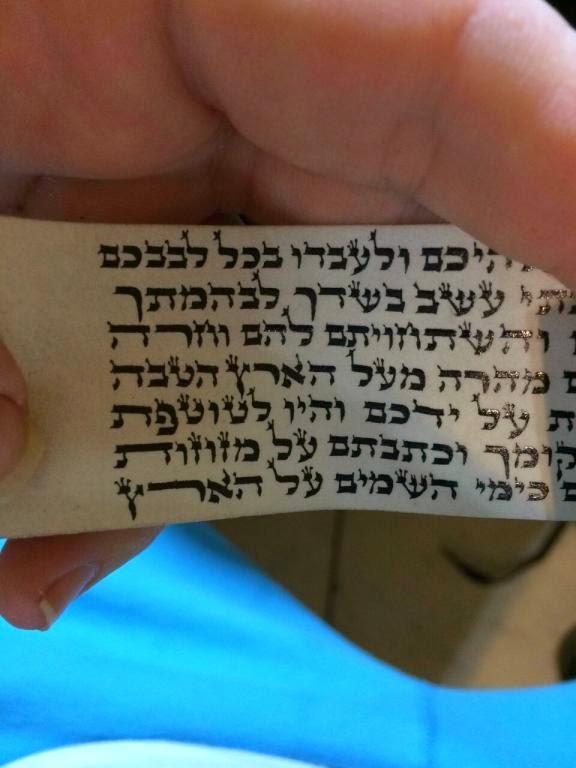 What is my reasoning or source as to why this would be the din by tefillin? Common sense. If the חסר ויתר are the same for S"T and Tefillin, and the פתוחות וסתומות are the same too, there should be no difference here, especially that we know the reason (as I mentioned above - 2 words or one word). Now allow me to ask "What is your reasoning or source as to why this would not be the din by tefillin? And again, nobody says it is פסול. You wrote above that the guy "wants everything 100% mehudar", so in any case it is not "100% mehudar". And also the price he payed in important here, because if he paid a "premium" price and expected to get everything 100% ok, well then this is definitely a מקח טעות. If somebody pays for 100% mehudar, he should get everything correct, including the ראשי שיטין , not like a quote that I got of $1250(!!) on these פרשיות, were the guy didn't even try to get the ראשי שיטין correct!! Even on the first line!! כ"ש וק"ו that וחרה אף should be on one line. And also someone should add תגים on the ט of הטבה, the מ of ובקומך and the ץ of הארץ and possibly other places but that is from what I see in the picture. The Mishnas Avrohom is clearly classifying these halachos for sefer torah. The whole subject matter there is sifrei torah. Many halachos brought down for one area of stam do not apply to another area. For example Kuba / Zanav is discussed in hilchos mezuzah. It does not mention it in hilchos tefillin, but it does not say either that it precludes tefillin. Yet the common psak is that because its mentioned by mezuzah only it does NOT apply to tefillin even though there is no logical reason for it to be exempt. Psuchos and stumos and chaser veyater are not good examples because these dinim are clearly stated in S'A and poskim as being applicable to tefillin. I suspected the case is as your saying. But.... please, please provide a source! Because in a Torah "shma yisroel" is on a line alone, but not in tfillin. שמע ישראל on a line alone is mentioned in קול יעקב in the name of the אמרי שפר but the אמרי שפר does not mention his source. In תפילין, there is a different מסורה as mentioned in כתבי האריז"ל that the lines are different. Now I see the source that שמע in the begining of the line and אחד by the end is from מסכת סופרים פרק ט הלכה ד.